As the August Congressional recess approaches, the safety of these communities remains in jeopardy as reauthorization falls prey to partisan politics. Every day that goes by without reauthorization of an inclusive VAWA is more one more day that women’s safety hangs in the balance. Now is the best chance that we have to pass VAWA before the Members of Congress leave to focus on their own reelection in November. Native American and Alaska Native women face complex jurisdictional issues that make protection, reporting, and prosecution of domestic violence nearly impossible. Imagine telling the police that you have been assaulted and having them tell you, too bad, we can’t help. This is the current reality for far too many Native American and Alaska Native women. Immigrant women in the U.S. often face higher rates of sexual harassment and of battering than other women, yet these women are less able to report these crimes due to their legal status, isolation and other factors. LGBT survivors often face discrimination based upon their sexual orientation and gender identity, preventing them from accessing life-saving support services. New provisions in VAWA would address these issues – but not if Congress can’t agree to get it done! Don’t let Congress go on recess without protecting women from violence. 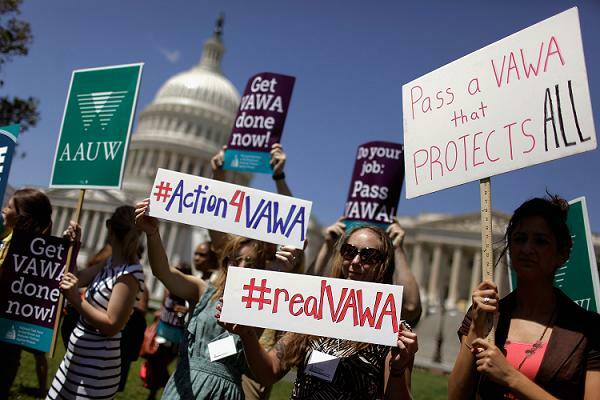 Demand that Congress take action NOW to pass an inclusive VAWA that protects all individuals and communities, including Native American and Alaska Native women, immigrant women, and LGBT individuals. This entry was posted in USA, Women's Rights and tagged gender-based discrimination, vawa, Violence against Women, violence against women act by Cristina Finch. Bookmark the permalink. AMNESTY INTERNATIONAL USA!!! Gracias Partilhar! Gender based violence needs to be stopped and VAWA is one step in that direction. Violence against women is rooted in a global culture of discrimination which denies women equal rights. The United States Congress needs to set an example for other countries by reauthorizing VAWA now! Vawa would be the change we need if it was authorised! I've posted a lot of comments on this subject and it all comes down to this: women are living in a dangerous and cruel world and this must stop. They must feel safe and equal with men….and feel like HUMAN BEINGS!